During the Summer Solstice event there is a daily contract from the Tarr Family which requires completing Sommer Solstice Arkfalls and then returning to the Fork to claim a weapon reward. Completing 10 Tarr Traxx Dailies within a week completes the Weekly contract for a greater reward. The Tarr Family reputation vendor has a white firework launcher. Other vendors offer other colors. Tarr Family have two contracts during Summer Solstice, both involve completing arkfalls then collecting a reward. The Tarr Family is offering rewards to all ark hunters who help against the current hellbug Misummer Mutiny arkfalls. Once done, head to the Fork in San Francisco for your bounty. Dedicated ark hunters will be treated to a bounty, courtesy of the Tarr Family. Most Reputation vendors offer a Midsummer Firework Launcher for reputation. 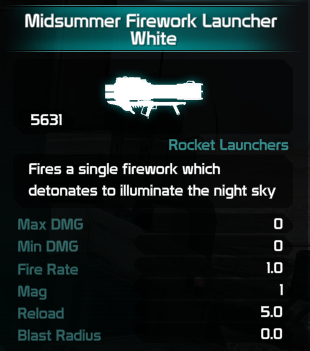 Midsummer Firework Launcher White, costs 420 Tarr Family reputation, 32 Keycodes and 25,000 Scrip.